Here we are again at the Amsterdam All-Zenobia Day -- and it's now Robbert Woltering's turn to strut the blogging stage. Robbert (that's Dutch, with two b's) teaches Arabic and Islamic studies at the University of Amsterdam. He is also editor of ZemZem, a journal about the Middle-East, North Africa, and Islam. And what, I asked myself, is a ZemZem? Undoubtedly you, too, would like to know. ZemZem, as some clever readers of my previous post were quick to spot, is the name of the sacred well at Mecca. It surges close to the Ka'ba, which houses the renowned Black Stone -- the holiest site of Islam. ZemZem may be an onomatopoeic word mimicking the bubbling sound of the waters, or perhaps it comes from the root z-m-z-m, which, I'm told, means 'swallowing in small drops' or, I suppose, sipping. [ZemZem] sprung when Hagar left her infant Ishmael crying for water and shuttled between Safa and Marwa trying to see if people are coming up to provide water for the thirsty infant. Ishmael was kicking the ground when this well sprung out and she came on telling the water "zimi zimi "meaning 'come close together'. She was trying to get the water in one place to be able to give her son a drink. Long before Islam, Arab storytellers were telling tales such as this about how things began. Poets streamlined the many contradictory traditions as tribes moved about, and created heroic origins for peripheral places and local events. Just so, Arab and Persian chroniclers, as preserved by Tabari, blended elements of folklore and fiction into a barely remembered history of Zenobia and Palmyra. Many of Tabari's tales rely on pre-Islamic sources and, together, they tell a story entirely different from that familiar to us from the late 4th C Latin Historiae Augustae (we've written about Tabari twice, so go first, if you will, to The Zenobia Romance I and II). In Tabari's tale, there are no Romans at all. There is no Roman empire, no legions and no Emperor Aurelian. Even the Persians and the King of Kings are hardly mentioned. It is rather an almost timeless world with Arab tribes battling each other -- a pot-boiler of war and intrigue -- in the desert. By the time that Arab intellectuals began to revive interest in the Palmryan queen, a millennium or so after Tabari, it came about as part of the cult of Westernization that swept the Arab world in the late 19th/early 20th century. A good example is the Egyptian romantic poet Ahmad Zaky Abû Shâdy. 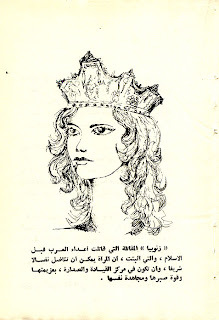 Abû Shâdy composed an historical opera in 4 acts, Al-Zabbâ or Zenobia, Queen of Tadmor. It was published (in Alexandria?) by the Free Masons. The Free Masons, I think, says it all. Abû Shâdy, a Coptic Christian,* was a member of the liberal Egyptian bourgeoisie, that small elite in the process of Westernization in the early 20th century. Egypt was in the vanguard of this movement, which was often expressed by the transformation of Arabic literature through the Western forms of the novel and drama. Abû Shâdy was the founder of the Apollo Society, which aimed to introduce a fresh atmosphere in poetry especially romanticism, and establish modern aesthetics. It must have been quite difficult to produce modernized fictional work which would not enrage the Muslim conservative element but would, at the same time, not dissatisfy the modernists. Although non-political, he was constantly under attack and finally emigrated to America where he died in 1955. Given Abû Shâdy's background, his time and place, you will not be surprised to learn that his opera follows the Historiae Augustae version of events -- a conflict between Rome and Palmyra and between Aurelian and Zenobia -- and not at all Tabari's Arab story of war between desert tribes. His Zenobia opera, as far as I know, was never performed. Adnan Mardam Bey's Queen Zenobia (left), a play in 4 acts, also depends on the Historiae Augustae; and there is no trace of Tabari's folkloric tales nor of the Arab heroes, Jadhima or Amr ibn Adi. While searching on-line for information on Mardan Bey (a hopeless task: I think he may be a son of the famous poet Khalil Mardam Bey , an assumption based on the fact that he edited that poet's diplomatic papers), I stumbled across a most serendipitous discovery. I'm sure Robbert knows about it, but quite unknown to me was Zanûbyâ Malikat Tadmur (1871) by Salim al-Bustani (1846-1884) of Beirut. 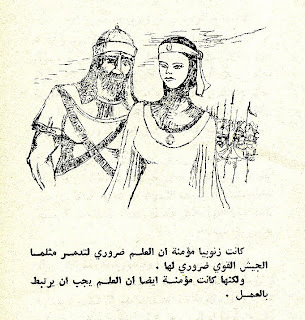 Zenobia, Queen of Tadmur is the first-ever Arabic historical novel -- and the second novel written by this almost forgotten 'father of the modern Arabic novel'. 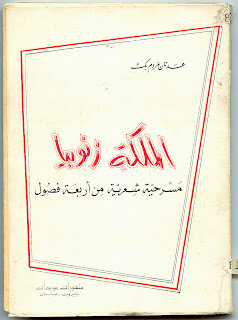 ** Before al-Bustani (and, in truth, until the 1950's), poetry remained the leading Arabic literary genre; the novel was perceived as a lower form. 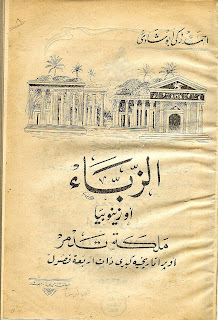 Even the new Beiruti bourgeois reading public was still used to the oral techniques of the hakawati (storyteller) and the sira sha'biyya (popular tales). Al-Bustani had to adopt a style suitable for this readership. He wrote three historical novels, all with fiery, patriotic Syrian heroines at the centre of the action. While his Zanûbyâ also follows the outline of the Historiae Augustae (and not Tabari), he is not so much interested in historical facts as in inculcating moral virtues. 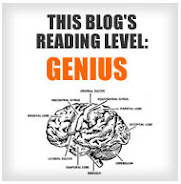 He admits to leaving out the depressing bits of her story in order not to sadden his readers. 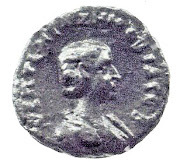 Zenobia and her (non-existent) daughter Julia are captured by Aurelian and taken to Rome. That's sad, so the story concentrates instead on the Palmyran conquest of Egypt, a love affair between Julia and Pisa, a Roman prince, and Zenobia's war with the Romans. Al-Bustani often interrupts the narrative to criticize indirectly the customs, morals, and actions of the Ottoman rulers of Egypt. To avoid the Ottoman censors, criticism is implicit: contrast, he seems to say, today's governors with Zenobia, a model of beauty, courage, and political wisdom. Most of his characters are rather flat and pale, mere mouthpieces for the author's opinions and values. In fact, he emphasizes the fictitiousness of the novel to show that fiction is a vehicle for a worthy purpose. So, the only nail-biting part of the story is what will happen between Julia and Pisa, the classic story of lovers belonging to two hostile camps. 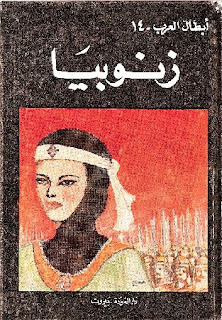 This Zenûbyâ emerges from a series of books on Arab heroes (Vol. 14: cover at the top of this post) as an Arab freedom fighter. Her hair is modestly covered to the very last curl. Hadn't the anonymous author ever seen Palmyran statues of women? They wore loose veils over the hair, rather like Benazir Bhutto. No matter. We have forty gods and they all do nothing. Find me one god, Longinus, in your wisdom. Yes, the empire needs to have a strong army, but we also need knowledge ... provided this knowledge is related to work (or labour). In other words, as Robbert put it, the book is meant to project the Gramscian concept of the organic intellectual, a quite common ingredient in the Arab leftist ideologies of the time. "Leftist" in this context, designates both the Marxist and Arab Socialist/Nationalist trends in Arab political thought. Gramsci's political theory, and in particular his version of civil society, would, it was hoped, provide a vision to bridge the gap between leftist intellectuals and the people they claimed to represent. Gramsci is a Marxist: that's why the bad guys in this book are not so much the Romans as the Palmyran sheikhs and merchants who refused to give Zenobia horses, and thus are to blame for making her rebellion a hopeless endeavour; but he is an alternative kind of Marxist -- who adapts the ideas of Marx to his own situation. For Gramsci, that was southern Italy, but, surely, it might equally apply to the backwardness of the Arab masses. At the end of the book, the Roman Senators insist that Aurelian put Zenobia to death so that Roman women will not be corrupted by her uppity example. Aurelian is cleverer: "No," he says, "it's better to make her marry and be a proper woman -- wife, mother, and cook!" As far back as 1847, in Lebanon, Butrus al-Bustani (the father of Salim) had called for the education of women. He launched a fierce diatribe against the prevailing notion that education of women was dangerous and would lead to atheism and to madness. He stressed women's inalienable right to become men's equals in feeling, opinions, and work. For a perfect finish, don't miss The Best Yet Mansour Rabani Zenobia Video (with English subtitles) shown by Robbert at the Amsterdam All-Zenobia Day; and my comments on that epic production, Zenobia Receives Royal Patronage and Zenobia's Terrible Curved Sword. And still not a hint of Tabari and his Arabic tales! Has the whole world outgrown the hakawati and the sira sha'biyya? On September 11th, Johan Weststeijn and Robbert Woltering will give their lectures once again, in an expanded version at the Klein Zenobia Congres voor Arabisten (Little Zenobia Congress for Arabists). I trust the 'Little' refers to the size of the congress and not to our dear Queen. * His granddaughter, Joy Garnett, wrote in (see comment below) to correct this information. Abû Shâdy was Muslim. My apologies. ** His first novel and the very first Arabic novel was al-Huyam fi jinan al-Sham (Love in a Damascene Garden, 1870). Massi Moosa, The Origins of Modern Arabic Fiction, Ch. 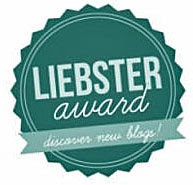 7, stresses al-Bustani's belief that the goal of fiction is to reform and regenerate society. While his themes pertain to the Arab world, he often uses a European setting to speak of Western ideology (socialism), "or to convey to his readers that the West can and must be learned from." (183); a summary of Zanûbyâ and al-Bustani's other historical novel appears in Ch. 8. *** Quoted from Joseph T. Zeidan, Juzif Zaydan, Arab Women Novelists: The Formative Years and Beyond (24). In his comment on this post, Robbert Woltering points out that both of my images of Zenobia from the Beiruti Arab Hero series (1975) show the queen dressed "in her fighting gear. (In the book, Zenobia constantly engages in physical combat herself.)". I hadn't realized that the anonymous author had put Zenobia so literally into battle. So I was wrong to give the impression that Zenobia with her hair tucked away was a model of Muslim modesty. Not at all! Robbert kindly sent me another picture from this book (left) of Zenobia wearing her crown, and with flowing locks of hair. While this hairstyle, too, is non-canonical for a Palmyran woman, it's AOK for late 20th C Beirut. In fact, she looks a little like the 2007 beauty queen, Miss Lebanon (below, left), with a similar sort of tinsel crown. Zenobia, the warrior who battled against the enemies of the Arabs before the coming of Islam, and who demonstrated that a woman is capable of nobly engaging in combat, and of taking up position in the centre of power with firmness and the strength of her resolve and self-discipline. I have just one quibble (I'm a great quibbler). No, not about her battling "the enemies of the Arabs", though she didn't do any such thing. But rather that she looks about 17 years old -- even Miss Lebanon 2007 looks older; and she was nineteen at the time. We don't know when Zenobia was born, or how old she was when she died; but she certainly wasn't an adolescent when she became Empress of the East. 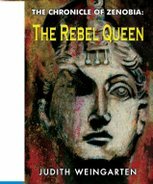 In Zenobia: The Rebel Queen, she was in her late thirties; but I could be wrong. Thank you for once again recalling the efforts of the Amsterdam Zenobia Day. Thank you also for the reference to the work by Samir al-Bustani. I was in fact not aware of its existence. (Its importance as one of the first Arab historical novels is less demanding of attention as it seems at first sight: there are many books with that claim. Also, I am more familiar with the Egyptian literary scene). Books.google is outshining Worldcat, where Bustani's Zenobia is not given. On a different note, if you have the time please switch the illustrations for Mardam Bey and Abu Shady, they should be the other way around. Lastly, on Zenobia's headcover in the drawing, this is not an attempt to veil Zenobia and make her follow vestial codes of modesty: on another drawing we see her with a crown atop a scalp with loosely dangling blond (!) curls. What we are looking at on the drawing you have uploaded, is Zenobia in her fighting gear. 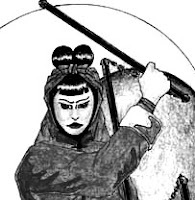 (In the book, Zenobia constantly engages in physical combat herself.) By the way, all drawings in the book will be shown and discussed at the second Amsterdam Zenobia gathering on September 11th, that you have already kindly mentioned. Illustrations have been switched. Apologies: my Arabic must be rusty :-). I'm pleased that, at least, I can now pick out the words Zenobia, Queen, and Tadmor. I didn't remember the physical combat part of her story in the Arab hero series (maybe my Dutch is getting rusty too). If you'll send me the photograph of her crowned and with flowing locks, I'll certainly update and correct this misleading impression. I just came across your post while doing research for a family memoir about my grandfather, A.Z. Abushady. He was actually a Muslim, not a Christian or a Copt. However, he was married to an English woman, hence perhaps that is the source of the confusion.